Temporary appointments basically apply to employees. When an employee is granted temporary appointment, he or she is good as employed however for a limited period of time only. This type of appointment is given emphasis and highlight whenever it is granted to anyone so that one could be aware of his or her current status in any company or organization. 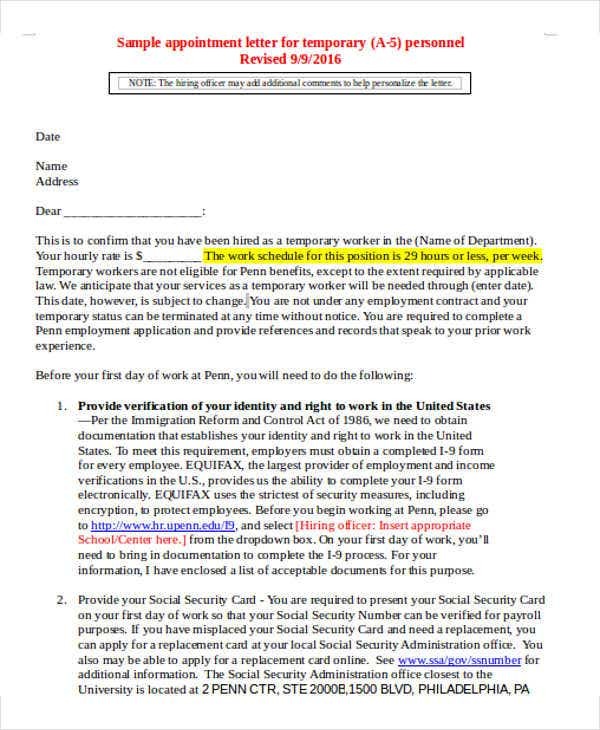 This type of appointment serves as a contract binding between the employer and the employee subject to certain conditions that is effective only within the agree span of time. 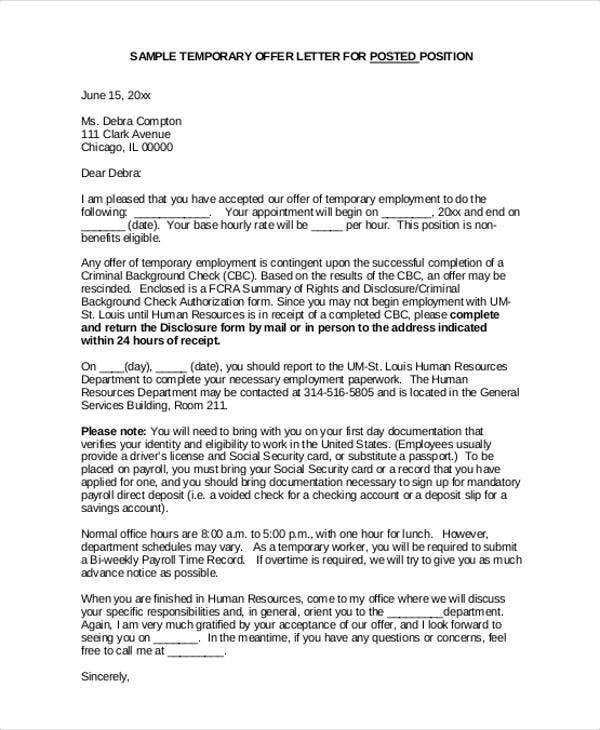 You could download this temporary appointment Letter Template here at Template.net for your convenience. 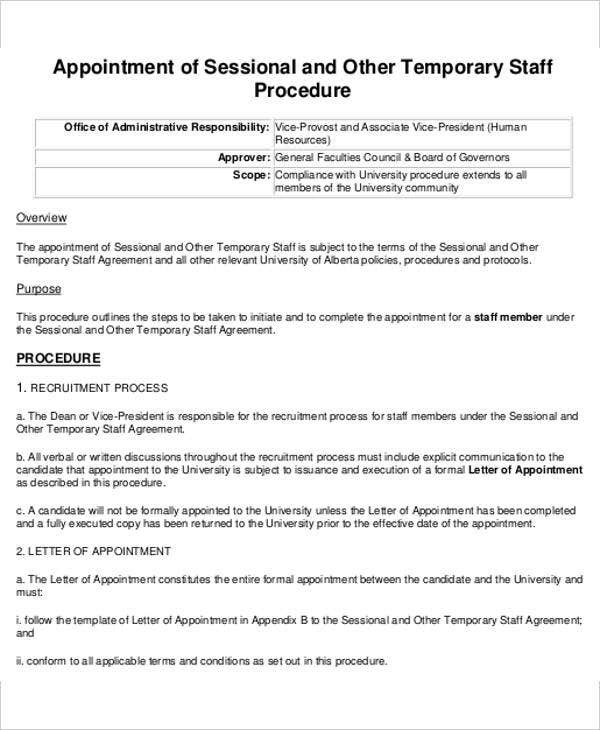 A short-term contract is also another term used aside from temporary appointments. Either way, it means that there are job positions that would not require a lot of time to be fulfilled. These are jobs that are very time limited and at the same time easier done that the rest of those in permanent positions. Other companies tend to look for employees who could temporarily fill these vacancies and perform specific tasks for them. 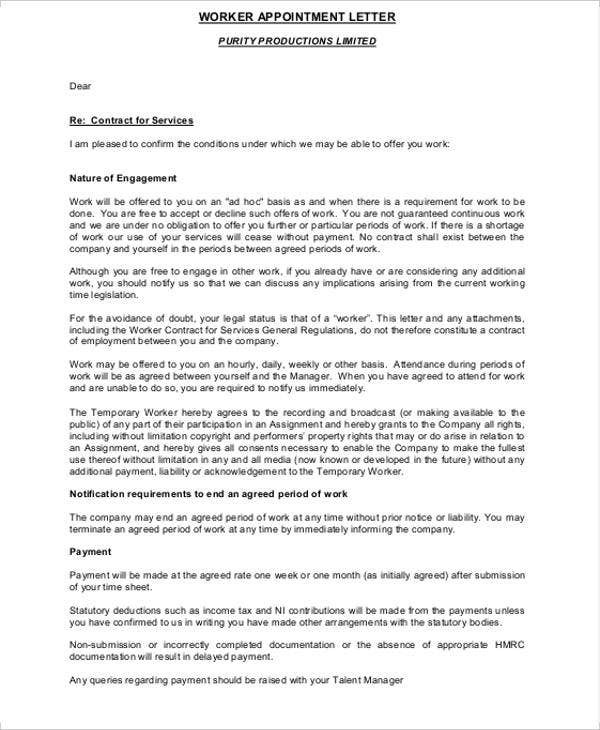 When you look into the terms and conditions stipulated in a temporary appointment letter, you tend to specify most on the time frame of the temporary appointment. Make sure you are able to provide this important detail in your letter. Contractual jobs. Some positions are really just meant to be for short-term only. It is possible that a particular job could be accomplished within just the stipulated time. By the time a certain job is done, there wouldn’t be anything else that needs to be done. Funding. When there is reduction of funding in certain companies, they will need to make more of temporary appointments just so they wouldn’t spend as much as they spend with permanent employees. Replace permanent employees. When permanent employees need to be deployed for higher positions, companies and corporations should need replacements. 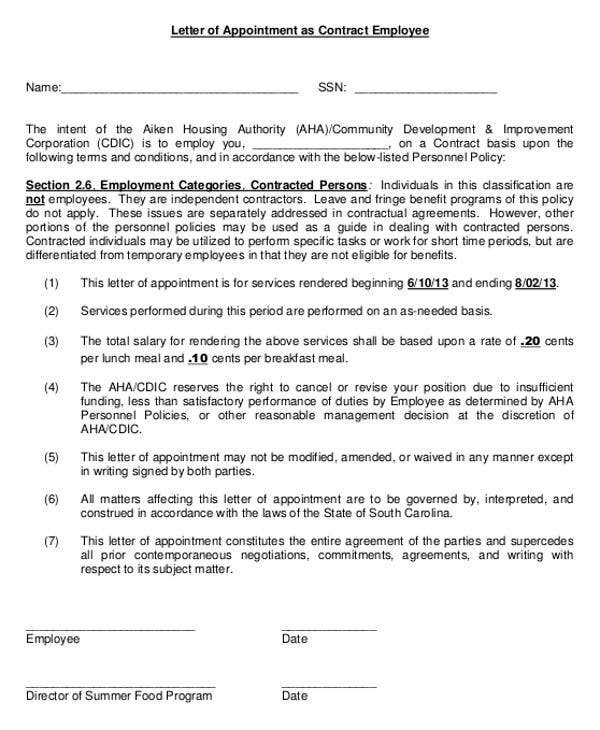 It is within the discretion of employers to agree with the length of appointment. When drafting your appointment letter, you must be keen with pertinent information that will soon be enforceable between parties. Provisions such as in terms of appointment itself as well as the duration should not be missed. Also, a well written temporary appointment letter must observe strict format so as to make it look professional and presentable. Don’t miss out on any information regarding your letter and see that this Offer Letter Template is definitely an ideal. 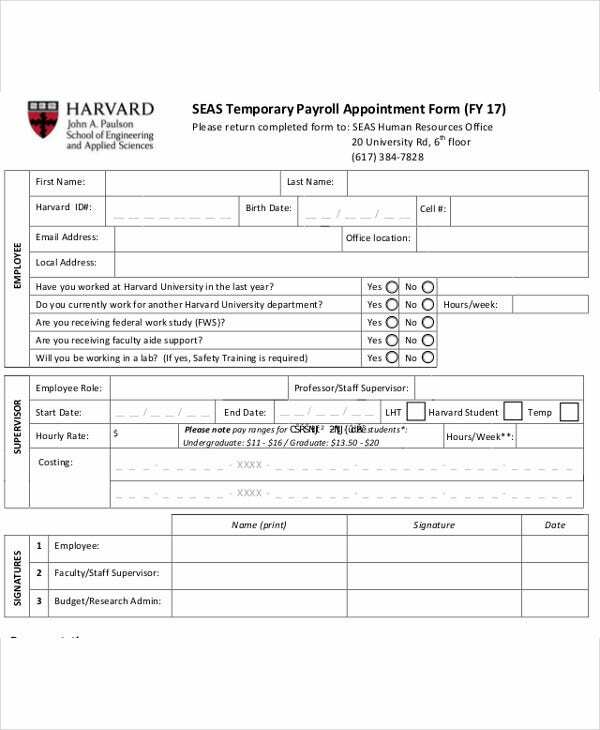 This page offers you a well-written temporary appointment letter that offers all the important sections that and ideal letter should have. All the specifications are already prepared and ready for download. We also offer other templates on various kinds of letters. You may also want to check out this Promotion Letter Template. 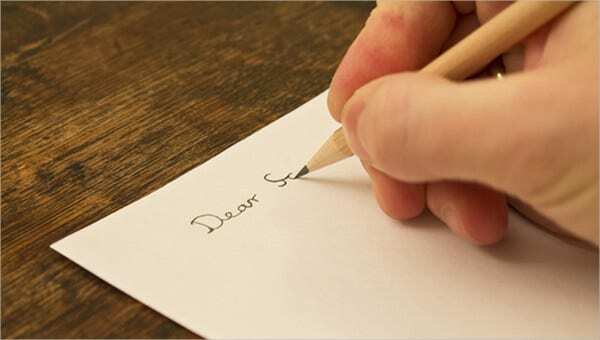 Don’t miss out on the technicalities of drafting your own letter as you could actually just easily download one and input the details that you need to include.